Derrick Goold of the St. Louis Post-Dispatch won first place in the Associated Press Sports Editors 2016 contest in the Beat Writing category for the 75,000-175,000 circulation division. Goold won for his coverage of the St. Louis Cardinals. The winner in each category will receive a plaque at the 2017 APSE Summer Conference at the Roosevelt Hotel in New Orleans June 26-29. (Click here to register for the conference). The banquet and awards dinner will conclude the APSE Summer Conference, which takes place June 26-29 at The Roosevelt Hotel in New Orleans. Goold beat out runner-up Eric Kolenich of the Richmond Times-Dispatch. Matt Pentz of The SeattleTimes placed third. Sports editors in the 75,000-175,000 category submitted 45 Beat Writing entries. The contest is open to APSE members. Click here to join. 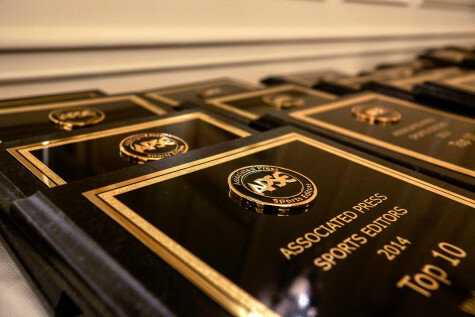 Contest chair Jeff Rosen and fellow APSE officers Tommy Deas, John Bednarowski and Robert Gagliardi numbered each entry, assuring they had been stripped of headlines, graphics, bylines and any other element that would identify the writer or news organization. In February, preliminary judges at the APSE Winter Conference in Lake Buena Vista, Fla., and off-site around the country, selected a top 10, with each judge ranking the entries in order from 1 to 10 separately on a secret ballot. Entries were given 10 points for a first-­place vote, nine points for second and so on down to one point for a 10th­-place vote. The final 10 were given to a second judging group, which ranked the entries 1-­10 in the same fashion. The winner and final rankings are determined by tallying the ballots. The beat writing category judges a portfolio of five stories by a single author that shows authoritative, newsy and innovative coverage of a beat. Entries included at least one breaking news story; one event or game coverage story; one enterprise piece and two wild-card stories from any of the aforementioned categories (or other stories or analysis related to the beat).